the subtropical temps are playing hard to get these days. all i want is for the weather to stay in the high 50s so i can stomp around Shanghai in ankle boots, leather jacket, and a giant scarf. my IM dicker boots are holding up surprisingly well given that i've already worn them all over the city, and i haven't been precious with them either. 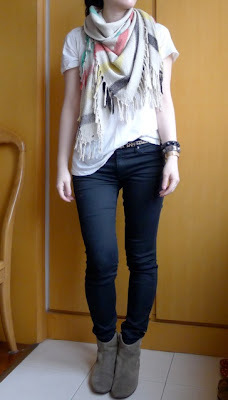 also can't stop wearing my uniqlo black skinnies lately. they're insanely comfortable and fit just so. the best of cheap and chic. what's your current style uniform? That leather jacket is awesome. You look fabulous! I empathize with your weather frustration. I feel your pain about just wanting to wear what you want to wear! But looks like you are doing a great job layering and taking it in stride. 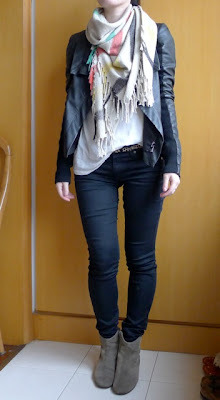 I've been wearing my J Brand dark wash skinnies religiously with my knee high riding style boots. I usually wear some sorta sweater or cardigan on top with a scarf and finish off with a rain proof jacket or 3/4 coat if its not raining (it usually is, pooh). Love that scarf and your jacket! My uniform at the moment is a brooks brothers shirt or a Kain tee with bespoke trousers and my new ferragamo vara mid-heeled pumps. Since it's getting cool in Delhi, I usually add my Steven Alan navy cropped wool jacket and a vicuna scarf. Easy and elegant. I love your outfit, the skinnies look great!! I love simplicity of your blog. No fuss no frills just real style. Easy clean essential. @Ammu oooh. your Vara pumps sound so perfect as a casual/dressy shoe for fall. what style is your SA jacket? i love the idea of you wearing a chic little SA jacekt in Dehli. what are chic people wearing these days on the street there? That jacket gets so much deserved love. I can't stop wearing flip flops and sandals. It only took 2 weeks of fall weather to make me miss not having to bundle up adequately, haha. 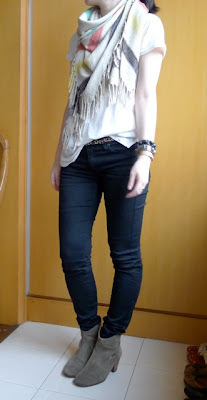 I wear them with dresses to look less like a slob but I often wear them with some cropped skinny jeans as well. 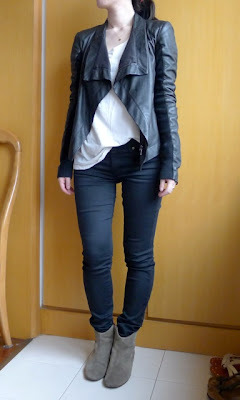 BTW Your jacket is beautiful and your skinny jeans look great on you... are they a shinny/wet look finish? I miss dressing for fall/winter. I live in a tropical country, but I used to travel a lot for work to places with 4 seasons, so I have boots & coats & a leather jacket that are now languishing in my closet. Although I do get to wear my shorter-shaft boots once in a while. And, yey for Uniqlo! I think they have the best basics and for such reasonable prices. @dontaskmetosmile yeah Uniqlo is fantastic. thank goodness for the huge flagship store here in SH!